At various driving times we are faced with the dilemma of being overcome by mud, snow or sand when least expected. A new product we discovered at this years SEMA Show in Las Vegas can help rescue you. The team at Trac Grabber have developed a creative solution that can easily be stored in any vehicle. 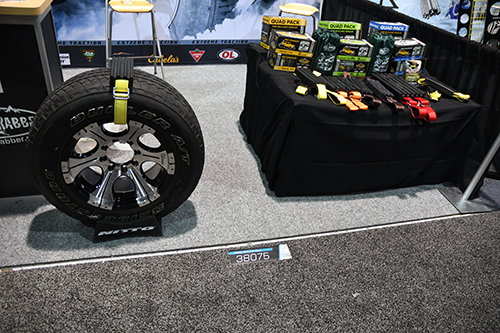 The design utilizes dense rubber cleats attached via a heavy-duty nylon strap around the tire through wheel openings. Available in two pack for two-wheel drive or Quad pack for four-wheel drive for cars, trucks and larger commercial vehicles. The only negative aspects of this design its only intended for open wheels and those with lowered vehicles may have a clearance issue with the limited fender gap. The overall product is a cleaver simplistic design allowing reasonable cost, light weight and ease of use. During the 2017 SEMA Show I was able to meet both the designer and the company owner who demonstrated the use and allowed me to try how easily it functioned. They explained the materials used from the webbed straps to the high-density rubber cleats and their durability in the industry. We had the opportunity to test the Trac Grabber and we were surprised how easily it worked. I recommend using only enough speed necessary to get movement started, as big horsepower spinning at excessive speed may be enough to break the strap free from the rubber pad. While I cannot assure the breaking point, it is common sense with enough force to friction ratio some component will release and the opposing object will accelerate will equal force. This is cautionary advice to increase the longevity of your Trac Grabber as I’m sure a trophy truck can over power it at full throttle in dense silt beds. During use the large rubber cleat works as a step to give your vehicle the initial lift while the spinning has the effect of a paddle wheel. While we have successfully tested in sand dunes we have yet to test in mud and snow in the dry Southern California area. After use there was no ill effect and the Trac Grabber was placed back into its convenient carry bag for its next use. The Trac Grabber is a very cost-effective device that should be in every adventurer’s vehicle, you cannot prevent everything but you can prepare. We now carry Trac Grabber as one of our trail tools during our group Southwest desert and Baja runs.